Star Trek Online’s Five Year Anniversary! When Captain James T. Kirk took the Enterprise out, it was originally scheduled for a five-year mission, so five years has a pretty big significance in Star Trek lore. 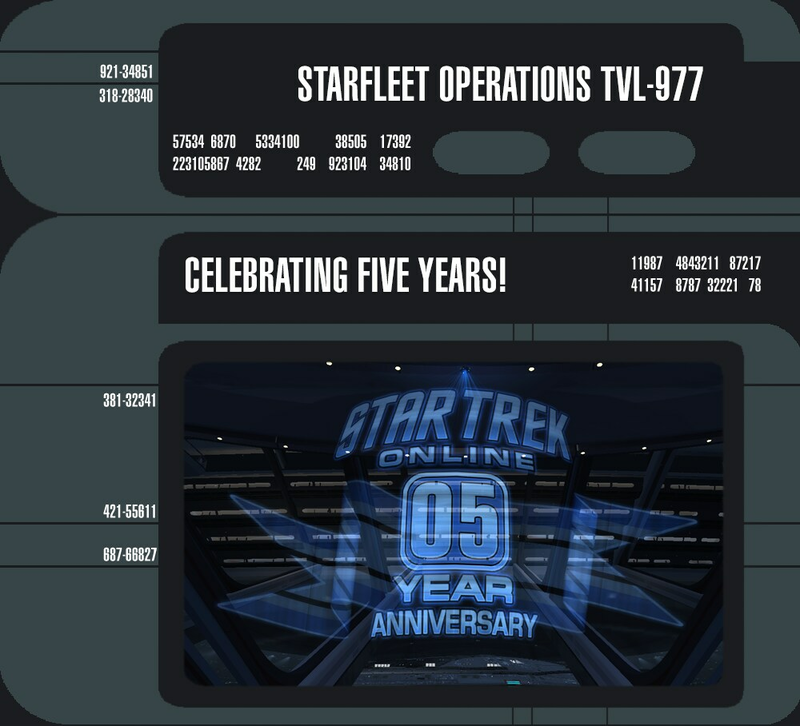 Seeing Star Trek Online mark a date of five years of live operations is a cause for celebration unlike any other year, and this anniversary we are pulling out all the stops. This year, we’ve got two additions to the Anniversary content that will run from January 29th through March 2nd of 2015. The first of which is a new Featured Episode called “Dust to Dust,” and the second is a new minigame where Q has tasked you with stabilizing Omega Particles across the galaxy in an effort to secure the keys to the new Kobali Samsar Cruiser Starship as well as craft some upgrade kits in the process. In “Dust to Dust”, captains will be teaming up with Captain Harry Kim, voiced by Garrett Wang, and Jhet'leya, voiced by Kim Rhodes, to investigate strange happenings on Kobali Prime. You’ll face off against the remnants of the Vaadwaur fleet, see the Kobali’s new flagship, and go deeper into a mystery revolving around Harry Kim that began more than thirty years ago. In addition to the new episode content, Q is up to his annual shenanigans. This time, in order to acquire Q-mendations, you will be required to stabilize Omega Particles found in various social zones in Star Trek Online. Talk to Q to get the mission “Omega Stabilization (Daily)” and you will be given three zones to visit where you must stabilize an Omega Particle using a new minigame. The minigame is simple; Omega molecules will fall in from the left in one of four channels. Captains will use either the keyboard or the mouse to move the capture device into the correct channel as the molecule hits the right hand line. The more molecules you capture, the more Omega molecules you’ll safely dissipate, and the more points you will score. Completing the minigame will score you at the very least a single Omega Trace. The better you score, the greater your chance to win Omega Slivers, Shards, or even Fragments. Even if you don’t have the daily mission from Q, you can still find and stabilize Omega particles across the galaxy. In any social zone there will always be two Omega particles up any given time. You might have to hunt them down, but they are out there. If you have the daily mission, a Waypoint will appear on your map where the two particles are currently found, to help narrow your search. Completing “Dust to Dust” will earn you 400 Q-Mendations, and each run of the Daily mission will earn you 40. For 1000 Q-Mendations you can purchase the Kobali Samsar Cruiser Starship in the “Collect 2015 Anniversary Event Rewards” project found in the Events section of the Reputations tab. Once you've purchased the ship, all your other characters will get a discount, requiring only 40 Anniversary Q-mendations to get the Samsar. More details on the Kobali Samsar Cruiser Starship can be found here.